I’m blogging for the first time in my new place. It’s been a week since we’ve moved in. Still settling in, unpacking, tidying, making minute homely adjustments around the house. 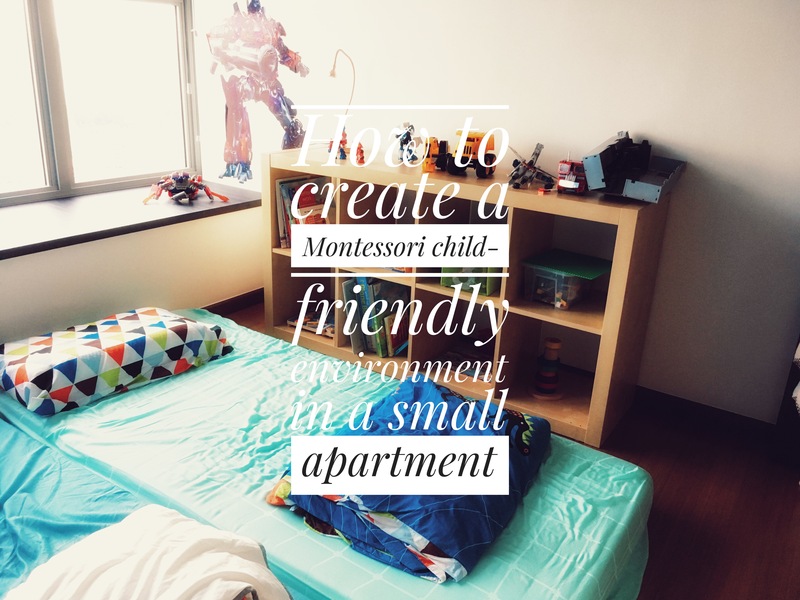 One of the first challenges was setting up child-friendly Montessori spaces & keeping spaces NEAT for a small home to a family of 4 & a helper. First things first, we purged out a tonne of old toys, clothes, baby stuff, my old clothes (yes, I will never fit into my pre-pregnancy jeans ever), hub’s old clothes, stuff & more stuff. It’s shocking how much stuff 4 people can amass. We literally purged out half the house. I tried using the Kon Mari method – anything that does not spark joy anymore gets discarded. It should have worked but to a mother, memories related to her child sparks joy. That teeny Cambridge baby romper that Bubs used to wear when he was 1 month old? Sparks joy. That wooden egg shaker that both boys used to play when they just learnt to crawl? Sparks joy. Those oh so cute little socks? Sparks joy. Like that how to throw? I had to take one last look at every one of those items that ‘spark joy’, etch that memory into my heart & move on. 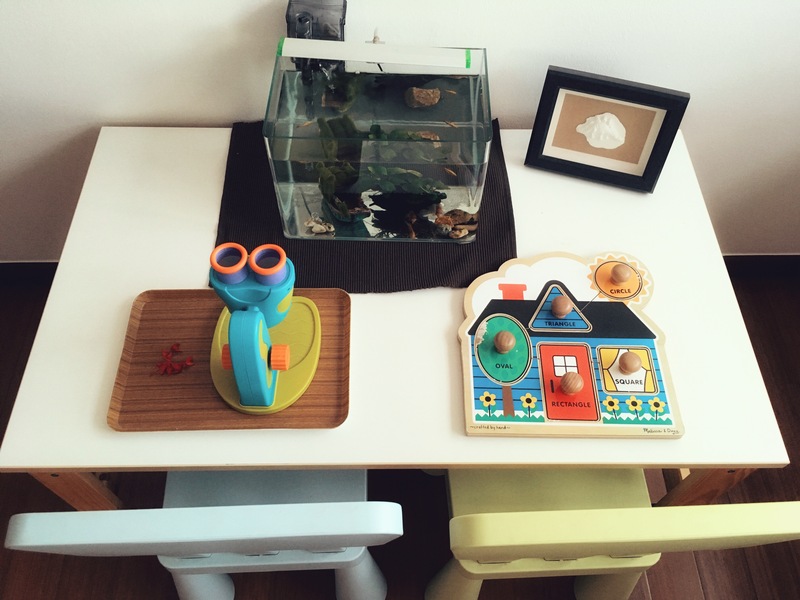 Here’s a few practical tips I noted down while setting up Montessori spaces around our new house. 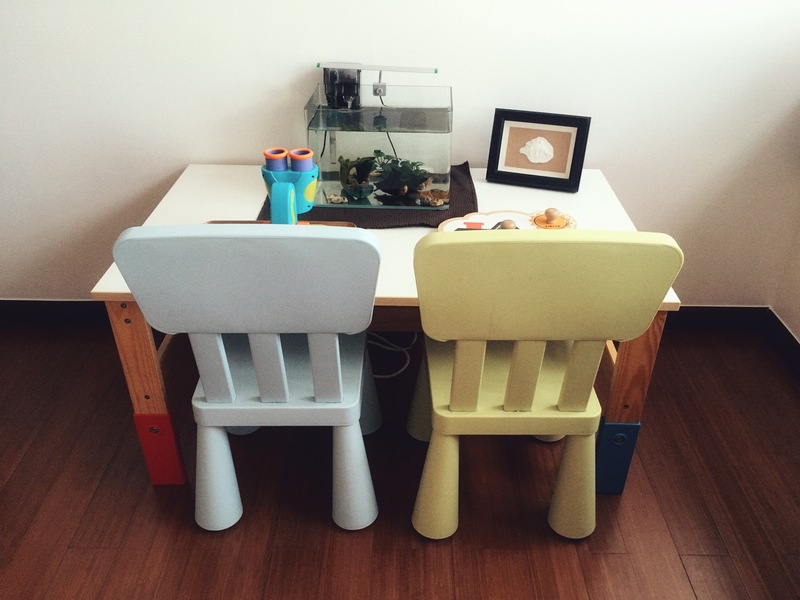 Places & furniture are easily accessible to a small toddler. Keep displayed toys & books minimal & rotate them bi-weekly. Promotes independence through daily routines such as taking showers, getting dressed, meal times etc. 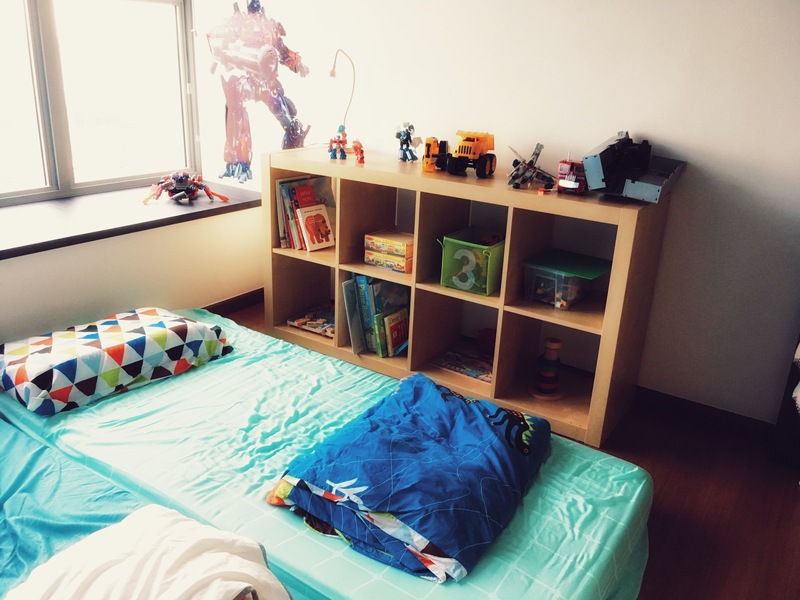 A quiet & peaceful corner for the boys to unwind, read a book or play their toys. In addition, I’m currently reading up on Charlotte Mason & I noted a few similarities which I am looking at incorporating into our new home. Keep structured lessons or any sort of mental work to morning hours. An atmosphere that is produced ‘from persons and things, stirred by events, sweetened by love, ventilated, kept in motion, by the regulated action of common sense’ – or basically an environment that includes natural elements of tumbles, tussles & triumphs. Space that allows beautiful music to be played while the child engages in quiet time. A great resource for all things Montessori! I gained a lot of wisdom from Deb’s blog. 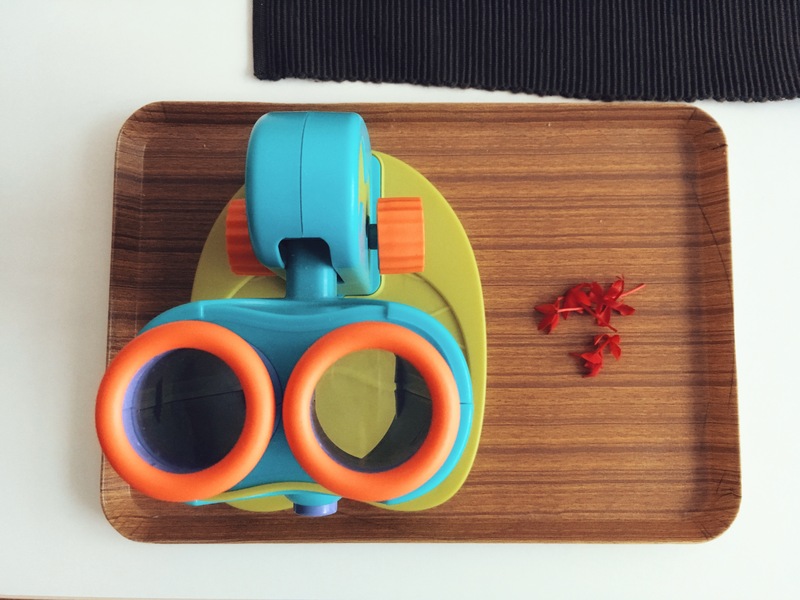 If you are looking at introducing Montessori at home, her blog is a keeper. It’s hard to find a Montessori mother who also happens to be a Singaporean. 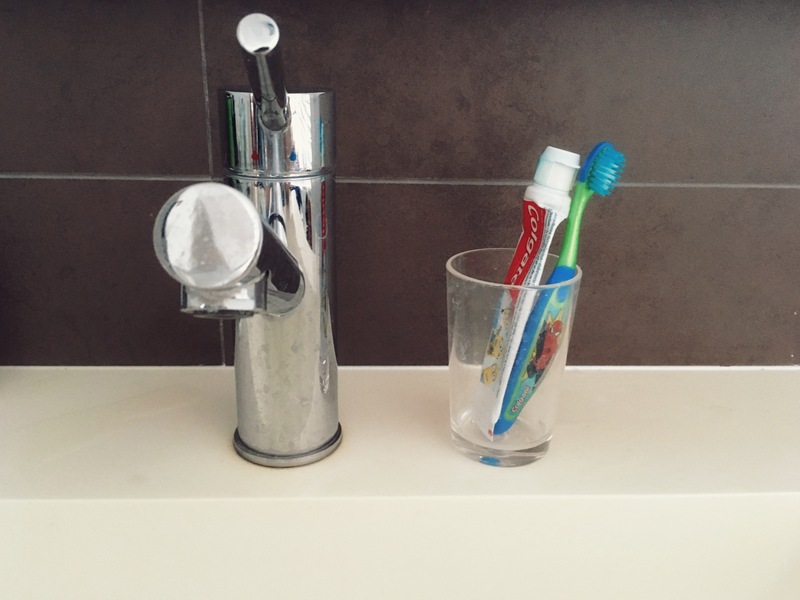 Jasmine’s blog is personable, relatable and filled with nuggets of wisdom on Montessori at home. Her family is currently living in UK & her blog is filled with lovely photos of her two children! I get a lot of Montessori homeschool tips & printables from Lisa’s blog. She also writes reviews on books & Montessori tools. A great blog on Montessori on a budget especially for SAHMs like myself. Here’s what I’ve done up thus far from this week of unpacking. 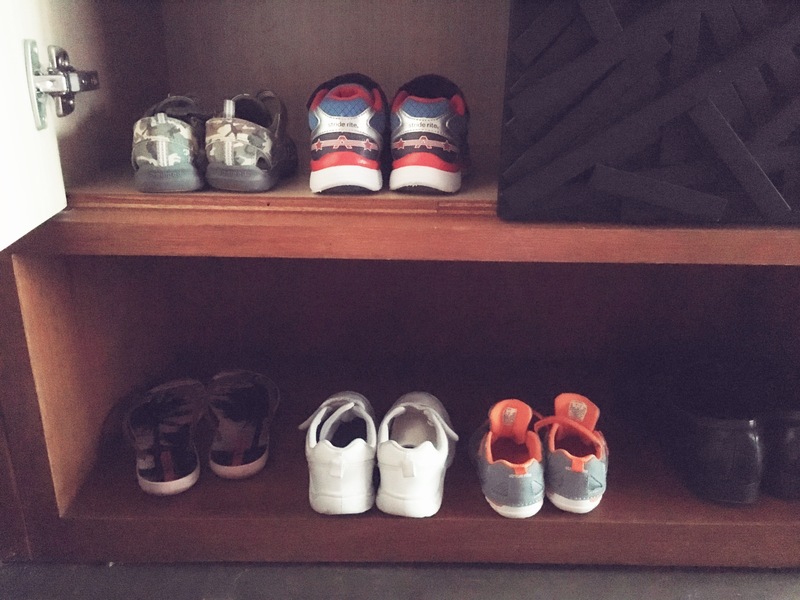 The children’s shoes are placed at the bottom shoe shelves, allowing them freedom to choose, wear & place back their shoes. I had to make the painful decision of not having child-sized tables & chairs near the dining area because of space constraints. The kids sit with us on their wooden high chairs. Bubs is at the stage where he doesn’t enjoy sitting in his high chair anymore. He’d rather squat, stand or fidget around on the dining bench while having his meals. 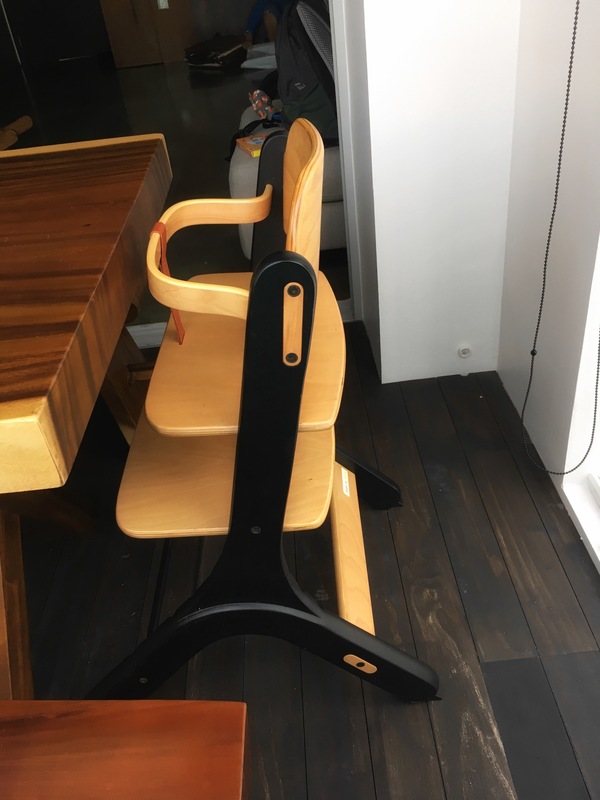 Little One is finding the wooden bar on the high chair restrictive & he’s starting to climb. So I am going to remove this bar to allow him freedom of movement up & down the chair. 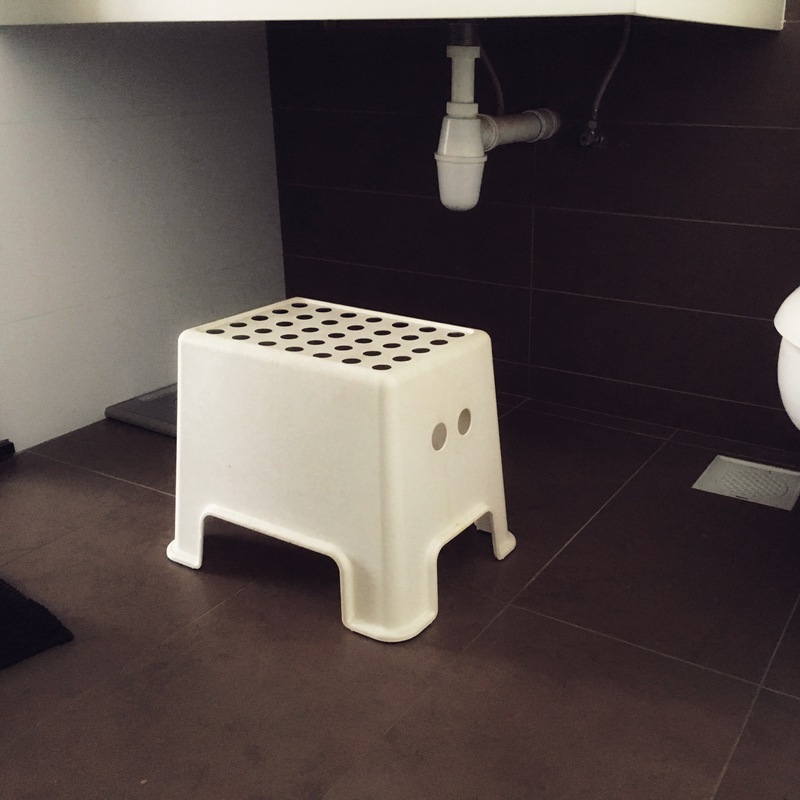 A simple plastic stool from IKEA allows Bubs to brush his teeth & reach the sink independently. 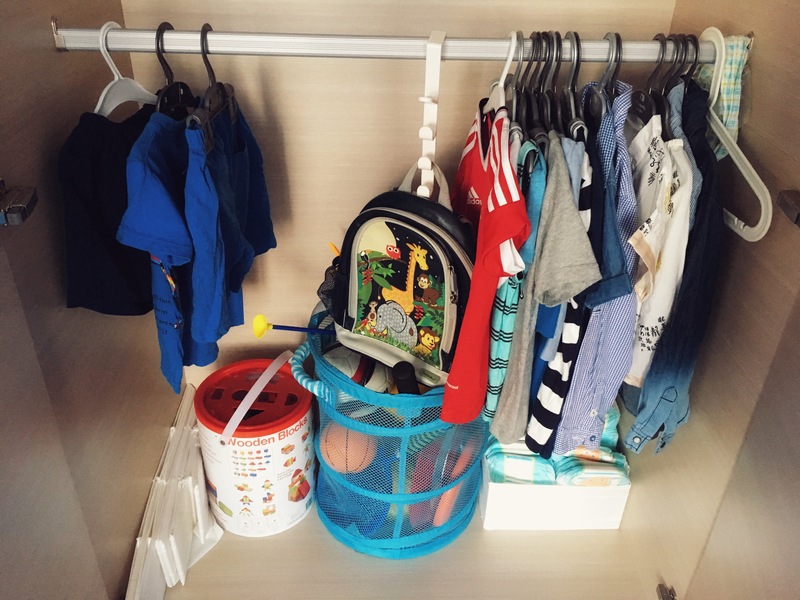 I used the lower clothes rack to hang most of the children’s clothes & bags. They are the same height as the boys so they can reach for the clothes & diapers, choose what they want to wear & learn to dress themselves. Their room is minimal & fuss free. 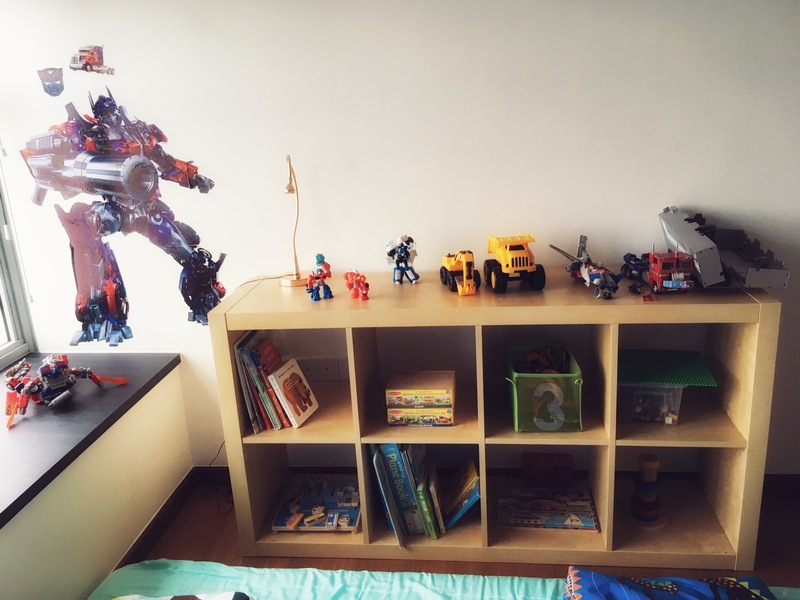 A simple wooden bookshelf from IKEA makes a wonderful Montessori toy shelf. Upper shelves are mostly Bubs’ toys. Lower shelves are for the Little One. I displayed puzzles, wooden stacking toys, Legos, cars & books. As you can tell, Bubs is obsessed with all things Transformers. They sleep on floor mattresses as well. Nothing fancy. I don’t have to worry whether they will fall off the bed & floor mattresses really allows a lot of freedom of movement for two young boys. I set up a simple kids study desk beside the Husband’s study table. LO is currently into those shape puzzles from Melissa & Doug. Bubs loves collecting flowers & twigs so here’s his current science display. I framed up a dinosaur clay ornament Bubs did a couple of years ago. The boys also help out in caring for their fish. Will be blogging on setting up a Montessori Kitchen & Living Space in Part 2! Previous postSweet 16 going on 17. Here’s to a brand new year!